No one who saw Denzel Washington walk through the ‘hood in Antoine Fuqua‘s “Training Day” will ever forget his menacing, charismatic gait. 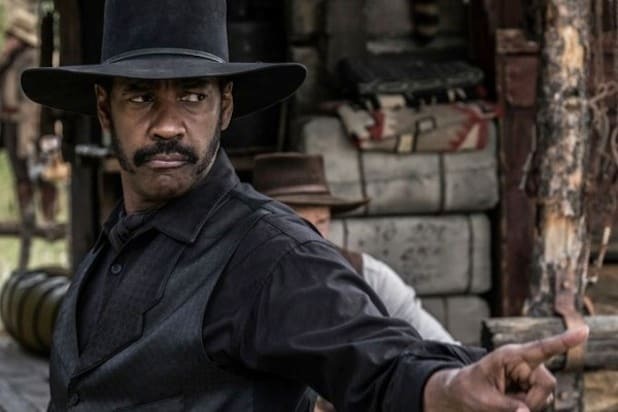 Likewise, you’re unlikely to forget Washington’s conflicted turn as a bounty hunter who grows a conscience in “The Magnificent Seven,” a remake by Fuqua that feels — for once — like Hollywood has gone color blind. You meet Washington in the saloon of a small town in the West that is being threatened with extinction by a rapacious, violent businessman (played effectively by Peter Sarsgaard). He shoots a bunch of people but never once does anyone raise the “n” word. The fact that the bounty hunter is black gets no mention and plays no part in the unfolding story of Sam Chisolm leading seven gunmen on a mission to save the town. Speaking to TheWrap after the premiere at the Toronto Film Festival, Fuqua said that’s what he was aiming for — a true take on Westerns that would feel contemporary. “I grew up watching Westerns — ‘The Searchers,’ all of them — with my grandmother,” he said. But it was not an obvious project for him. Fuqua was going to work on “Southpaw” for MGM (eventually released by The Weinstein Company), but then the studio gave him a script for the remake of a movie originally made as “The Seven Samurai” by Akiro Kurosawa in 1954. Fuqua had seen it, as well as the Western made in 1960 with Yul Brynner and Steve McQueen. The movie is tracking for a strong opening on Sept. 23.